October 25, 2013 - "Press Releases"
Custom Built Plastic Pallets announced the company’s recent innovative material handling solution for VF Corp, an $11 billion apparel and footwear powerhouse with a diverse international portfolio of brands and products that reach consumers wherever they choose to shop. Custom Built Plastic Pallets engineered a plastic pallet specifically configured for the company’s order picking forklifts. It is an innovative hybrid pallet constructed of recycled plastic providing superior strength and durability. 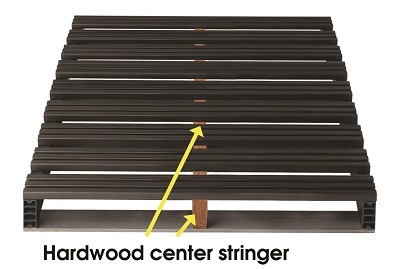 To further customize the pallet for VF Corp’s order picking operation, a HARDWOOD 2x4 was used for the center stringer rather than the standard plastic stringer. This hardwood stringer provides the perfect connection for the forklift’s clamp. It ensures a safe and secure standing platform for the operator while working at various heights within the warehouse.